It's been one Democratic Congressional District Presidential Caucus, one poetry reading at the Neon Gallery, one finished diary and another one started, a double platelet & red cell donation, and several full skies of rain falling in our part of the world since my last confession 6 weeks ago. The rain has stopped. Our lawn has been mowed. I can hear the grass growing again already. I confess six weeks is a long time between confessions. I guess that makes me a fallen-away blogger returning to the fold or something like that. I could say I will try to do better, bet we all know better. The fact is that I tend to be more selective about saying something in my blog than in the early days. Maybe I'm getting wiser and figure no one really cares, but who knows. On Friday, May 29th I had a reading at the Neon Gallery that was sponsored by the Writers Place. 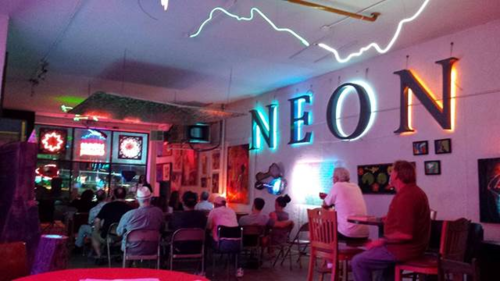 The Neon event is a quarterly music, poetry and art event at a downtown Kansas City location. I've attended many of these, but I confess this was the first one in which I was on the program. The Neon reading was really good. Those that missed it, well, they missed some good music, some really cool art, and well the readings were great. I confess I'd even rate my own as pretty damn good and I tend to be my harshest critic. The poet Pat Daneman (who I had never heard before) was magnificent. Sara Nicole Glass AKA Miss Conception both sang and shared poetry. While I've heard her before, she has a couple of pieces that really resonated with me. I confess that each time I hear the River Cow Orchestra I think I enjoy them more. Bob Savino was quite animated, but then when isn't he. The evening was closed out with music by Rick Malsick. This event is sponsored by the Writers Place and I was honored to read with the other talented artists. I've said it before and it's worth repeating. As someone who journals on a regular basis I always love the feeling when I complete one journal and replace the leather binder with a fresh new one. I confess that I am not sure, but I belief it must be the starting over with clean pages that gets my emotions flowing. When donating platelets at the Community Blood Center recently I was asked to do a double platelet and red cell donation. I've done double platelets before - my count is always high and they love to be able to double down. I've never done red cell at the same time. I confess that I spent that whole day really drained. I'm usually a wee bit sluggish after the platelets but this was way worse. I confess I may not feel I can do that much again. Probably just the platelets and maybe back off the red cells. It's really a beneficial thing to do and I would always encourage those who can, donate blood and or platelets whenever possible. I did a lot of writing this past weekend and it's tugging at my heartstrings again tonight, so I'm off to see what I can put together. Until next time, be yourself. No one does it better than you!